Geopolitics is for me a major priority, Why Ukraine became one of the most important topics for all Lithuania including my party and myself. Last March during Parliamentary Assembly of Lithuania, Ukraine and Poland, we presented the initiative saying that some kind of Marshall Plan for Ukraine should be developed. This initiative was presented during European Peoples Party Congress in Malta where Angela Merkel and Petro Poroszenko where also present. It was approved and Poroszenko, caming back to Kiew, said that this was a breakthrough for Ukraine. And now we have to implement it. For this reason we try to explain in different capitals why such a plan is needed. The logic is very simple. I am trying to imagine what is the strategy of president Putin towards Ukraine? My answer is very simple: not to allow Ukraine to become a successful country. Success of Ukraine can influence opinions of Russian people in such a way that is not the best for Russia. On the other hand unsuccessful Ukraine can became some kind of grey zone. So if we agree with such an understanding of Putin than we have to ask in the West the question- what is our strategy towards Ukraine, unless we do not want to allow Putin to win with his strategy. What we are going to do is to help really Ukraine to became a successful country. Here we are coming back to our own experiences. Why Lithuania, Poland, and other countries of Central and Eastern Europe, which became members of EU, were so successful during the last decades? In general, after looking at those decades, we can say that some kind of miracle happened. Why we were so successful with the reforms. My answer is very simple – the EU offered us, from the very beginning, the membership in this organization. For Lithuania it was a base for our political process to make all needed reforms. This is not the case for Ukraine. Because of different problems inside the EU, and the problems in Ukraine this country is not offered for the time being the membership in the EU. And that is why we in Lithuania started to speak in the very clear way that in this case it can make no motivation for the policy inside the Ukraine to such big level of reforms as we would like to see it. Therefore the question was haw to keep motivation inside Ukraine for reforms, painful reforms, when the perspective of membership in the UE is not offered. Yet here we have a historical example – the Marshall Plan. Its goal was to keep motivation of economists for the process of recovery in France. Italy, Greece, if it is done in a proper way. We base our proposal on work of very well known Ukrainian experts. They are facing this problem: why Ukraine’s economy is not growing up in much larger numbers (actually 2 or 3 percent), why not 6 or 5 percent? The biggest problem, besides corruption and bad management, is lack of investment mind. Let’s combine western community efforts to create such a conditional package of 5 billion to invest in Ukraine, on condition of continuation of reforms. Let’s see what we have now? Really, it was a very intensive year. A miracle not happened, but we are quite satisfied with what we have managed to achieve. First of all it appeared that the problem is for the time being not new one, because all in Kiev, in Brussels, and in EU Commission calculated how much of financial assistance Ukraine has got since Maidan. However this is not we are talking about. We are talking about investment mind, which will go to real economy. It appeared that since Maidan Ukraine got promises from different financial institutions, like European Investment Bank, like BRD, World Bank, German Bank, in sum – 7 billion euro. 5 billion is still on the table and the reason why did not managed to use it is not corruption, or something like that, but simply that their absorption capacity is too low. There are not projects, not centralize authority, which is cleared mandated to push forward, but this is not very special. We have faced the same problem in Lithuania in the year 2000 and what we did, we created the special agency – Central Project Management Agency, which resolved many problems. Therefore we are presenting now this example to Ukraine and they are looking at it very carefully. Also we are pushing the government of Ukraine to create the clear list of priorities. We started last year the discussion with Ukraine and now they are working on this list. On the other hand we are discussing with the EU, and have some kind of progress. Recently its commissioner from Committee for Near Neighborhood has announced a special project, which nobody wanted to called Marshall Plan, but its speaks exactly the same language. It is offering the new money, despite of the fact that are still problems with spending the old ones, at the level of 500 mln euro for this year if Ukraine will adopt the three legal steps: business low, energy commission low, and regulation concerning ngos. That is a good step forward. Ukraine is coming to the election year. We are not looking to the near perspective, but also we are trying to look to much longer perspective. How Lithuania. Poland, the countries which have the strongest interest in Ukrainian success, can work out some king of strategy looking for longer distance, something like next decade? We need to understand that reforms in Ukraine will not go very rapidly, and the motivation within western community for taking care about Ukrainian development will not be easily kept at the very high level. We, countries which have the biggest interest in Ukraine, we need to look into possibility to speak to the West not only how to help Ukraine, but also how to have a joint or consolidated, western long term strategy towards Russia, if we want to assist Russia to become more normal country, maybe after Putin. I think that the only way we can do it really is to invest in creation of belt of successful countries around Russia starting from Ukraine. And to speak really about what we could do and how relation between more normal Russia and the West will be developed, if Russia will changed herself into more normal country. This would be an instrument for motivation of the West to speak about such a strategy in order to keep motivation of the western countries towards Ukraine. And therefore we are talking about joint partnership. If we are looking towards longer perspective we see very important days. In 2027 Lithuania will hold the presidency of UE. I hope that at that time the EU would be inside in a better shape, after Brexit, maybe after refugee crises, and problem of Western Balkans also would be resolved. If Western Balkans would be closed to membership in the EU by that time it would be much easier for us to speak about such a perspective for Ukraine, Moldova, and Georgia. Also would be easier to speak for us about multinational financial perspective. Wee need to start to plan what will happened in 10 years time, if the things will move. In such a case 2027 is a very important date. But before that date it will be 2025 and Poland’s presidency of the EU. It will come after 2024, when Russia will have the new president, means Putin will appoint him, or will be elected, or Putin will held the referendum, which I think is more likely, to extend his presidency for ever. 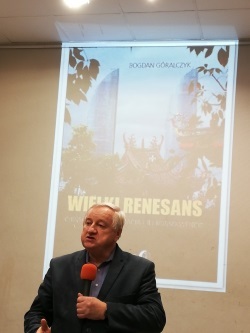 And the strategy towards Russia, which the western community does not yet have, will become very important issue which Poland will manage to resolve. The problem is that if you compare Russia, like imperial entity, with France and Great Britain having long tradition of democracy, that is not a case in Russia. Russia is in difficult situation. I do know now how we can assist Russia in repeating European developments which Europe faced during the last 300 years. Are we talking about Euro- Asian development, or about China? In my opinion Russia will not abandon the European direction and Putin will stay in power longer than usual, means next 25-30 years. That means that we in the West should invest in creation of a belt of successful countries around Russia, but we should be naïve. We should not abandon the opposition and ordinary people. Such a regime which Putin has created can stay for a quite a long time and to expect Maidan or some kind of revolution insisde of Russia it would be irrational. It could happened but we should build our forecast on a more realistic approach.